We arrived at the event very well prepared. Since we finished our robot early this year we were able to devote 6 hrs before the competition just for practice. On Wednesday the drivers practiced at the Ambler Ambulance station. They have a long hallway with the same type of carpet as the playing field so our drivers had a great feel for how the robot drives. On Thursday, we practiced at Arcadia University in the “Bubble”. (An indoor sports arena.) Because of The Bubble’s high ceiling, we were able to practice shooting and human player Frisbee throwing. 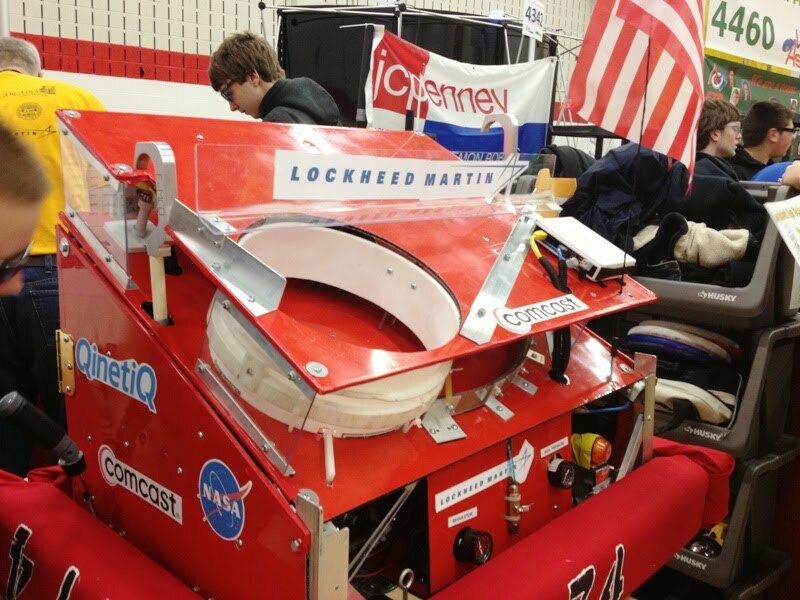 Each year, to add some fun to the competition, we name the robot and pick a theme. (Last year we had a shark theme.) 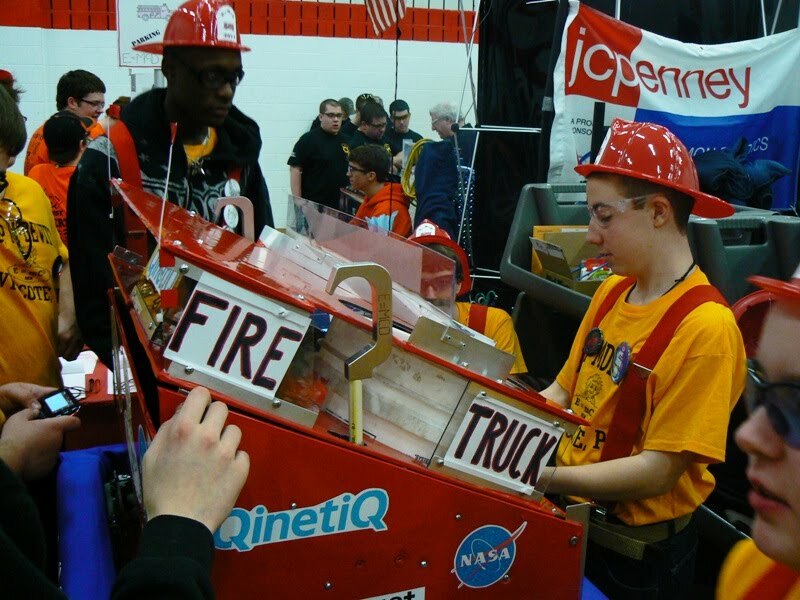 This year we named our robot Fire Truck and have gone with a EMS image. Having an image adds fun to the competition, but is also serves the purpose of helping the other teams remember you. Here we are in the pit getting ready for the first match. We started the competition with 6 straight wins and jumped into first place. Here is one of the drive teams ready for a match. We have 2 drive teams this year. Here is the robot from the other side. That white circle is our Frisbee hopper, it is part of a used 5 gallon paint bucket we found in the Arcadia shop. We hit a tough streak toward the end of the qualifying round and finished with a 7 and 5 record, but we proved ourselves one of the best shooting robots in the competition. Many teams do extensive scouting during competition keeping detailed statistics. Team 363, MOE from Delaware tracked our autonomous shooting on the first day. We made 23 of 24 shots for 138 points and they gave us the award for “Best Autonomous”. Overall in the tournament we made 57 of 60 autonomous shots for 95%. During the teleop phase we frequently made 11 of 12 shots. Our human players were able to score 2 colored Frisbees during the last 30 seconds of the competition. We played 20 matches and were able to score 10 points by hanging on the pyramid 19 times. We did not finish in the top 8, so during alliance selection we waited to see if we would be picked. We were the second team chosen and joined the second seeded alliance. (At robot competitions it is always 3 robots vs 3.) Our alliance won our quarter final 2-0, then won the semi final 2-1. In the finals we won the first match, but lost the next two. Being the second selection and making it to the finals earned us a lot of points toward the Regional Tournament at Lehigh on April 14th. If we perform well at our next competition at Springside-Chestnut Hill on Friday and Sat we will be a lock to attend. Here is some of the team members with the robot.